Today we celebrate Christ’s greatest gift to mankind, the gift of His Body and Blood that we Catholics receive every time we go to mass (assuming we’re in a state of grace). Jesus wanted to be a part of us and have us be a part of Him. Since He knew that He must die for our sins and return to heaven, He left us several means to be with Him in spite of his physical absence. First was the Church. He said to Saint Peter at Caeserea Phillipi, “On this rock I will build My Church”. That church continues to exist today with more than 1 billion members. On Pentacost He left us the Holy Spirit, our advocate. We receive this spirit at baptism, at confirmation, and in the anointing of the sick. Priests and deacons receive the Spirit in the Sacrament of Holy Orders.He’s also available to us at any time and any place, waiting to answer our prayers and give us strength. And He gave us the Eucharist. In today’s Gospel He told the Jewish crowds that He was the Living Bread. “Whoever eats this blood will live forever.” It was at this point that many of his followers turned and walked away. Many of our protestant brethren will say that Jesus was only speaking symbolically. He didn’t really mean that His Flesh and Blood were real food and drink. Even those who believed didn’t run up to Jesus and start gnawing on His arm. What did He mean? 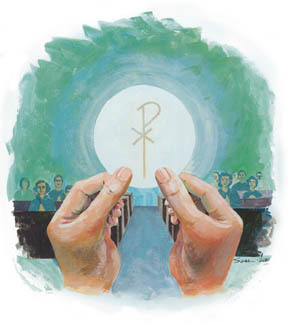 My fellow Catholics, you and I have the opportunity to become one with the Body of Christ at each and every mass. That’s what we celebrate today. I have two questions for you to ask yourself. Number one, do you appreciate the miracle that takes place at every mass? Are you in awe of this amazing mystery that we celebrate in our presence. Two, do you receive Christ’s Body and Blood with the reverence and joy it deserves and three (oops) When was the last time you invited someone to join you in this miraculous meal? You know the right answers so you can score this little exam for yourself. The scoring is simple. If you got all three right you get an A. Anything less, your faith could use some work. You’ve heard it said that religion and politics don’t mix.. Some misinformed souls even think the Constitution calls for “the separation of church and state”, even though there is no such language in our nation’s most important document. I’m afraid that politics and religion do mix and in fact it’s almost impossible to separate the two. Case in point: NBC Sports began its coverage of the US Open golf tournament this past Sunday with a “patriotic piece” celebrating the fact that the “US” Open was being played in the nation’s capital. Featured in the segment was a group of grade school children reciting the Pledge of Allegiance.” So far, so good. But, some genius at the network decided to edit out the words “under God”, not once but twice. Let’s be realistic here. Once might have been an editing mistake. Twice was deliberate. If we’re to believe that this was truly an accident and not intended to offend anyone, then NBC Sports must be run by imbeciles. Doesn’t anyone screen this stuff before it goes on the air? The phrase “under God” in the pledge has been a subject of controversy for years. Surely someone must have questioned its omission. What about Bob Costas, the host of the US Open coverage. Costas calls himself a Catholic though his battle with then Archbishop Raymond Burke over the hiring of a renowned pro-abortion, pro-embryonic stem cell singer to headline an event for Cardinal Glennon Children’s Hospital raised some serious questions about his Catholicity. Whether he’s a serious Catholic or a nominal Catholic, he should have seen the potential outrage that this piece would cause. Whatever your religious persuasion, if you believe in and love God, (which means you are in the majority) then you have to be concerned and angered by NBC’s actions. This country was founded by God-fearing men who never expected to have their words twisted in an effort to push God out of our life. This is a nation “under God” whether the atheist minority likes it or not. You and I must stand up and protest what’s happening in America today. I don’t want to sound like a paranoid Christian but……if the phrase were “under Allah” I doubt that NBC would have the intestinal fortitude to mess with it. I’m just sayin’…. I’m going to go out on a limb here and make a bold prediction. The US economy is in a mess. The Democrats and the Republicans have very different opinions of what’s going to make us well. I don’t think either one of them has the answer. The answer lies somewhere in between, but today’s climate in Washington makes compromise almost impossible. I believe the answer lies with the very guy that so many people are trying to push out of the public square. This nation was founded by God-fearing men leading God-fearing citizens. And, we’ve been abundantly blessed. Personally I believe that the same Holy Spirit who inspired the writers of the scriptures inspired the authors of our founding documents. How else could a small group of men, living in the 18th century, create a system of government and the documents to support it that endures to this day? Unfortunately, subsequent generations of Americans have drifted away from the principals of our founders and of our Creator. Now we’re even letting a minority of Americans (and some non-Americans) push God out of our secular lives. I can’t speak for God, but if I were Him I’d be plenty ticked off. Now, here’s that prediction. Our country is never going to get better until we embrace God again. I don’t mean just giving Him lip service. I mean following the Ten Commandments and the Golden Rule, attending Mass (or the church of your choice) on a weekly basis, and making yourself heard when others try to take away your religious rights. We’re never going to get moving in the right direction until our elected employees in Washington begin to work for the people and not for themselves. Meanwhile, if we don’t act, the forces of evil are amassing against the United States. These are forces that have existed for years in small pockets, mostly in the Middle and Far East. But modern communications tools have made it possible for these groups to unite against a common enemy. That common enemy is us. Frankly, I don’t think we can repel an attack by our united enemies without God’s help. Our “Red Sea” moment could be coming sooner rather than later. Will God be on our side? I think that’s up to us. And I don’t think we have a lot of time. I can’t believe how long it’s been since my last post! I apologize for my inactivity. I will try to do better in the future. Here’s my homily for Trinity Sunday/Father’s Day. I hope you like it. Today is Trinity Sunday, the day we celebrate the unique nature of our God, Father, Son, and Holy Spirit. Here in America it’s also Father’s Day. It’s unusual for the two celebrations to coincide since the Church calendar and the Hallmark calendar are two very different instruments but here we are. I’ll get to human dads in a minute, but first I want to take a look at the relationship between God the Father and God the Son. We know that both of them have existed since the beginning of time. In the very beginning, in the Book of Genesis, we hear God talking to someone. Who’s He talking to? He’s talking to His Son. How do we know? John tells us at the beginning of his Gospel. “In the beginning was the Word, and the Word was with God, and the Word was God. He was at the beginning with God. All things came to be through him, and without him, nothing came to be.” The Son, Jesus, was with God from the very start. So God creates this beautiful world for us, “through His Son. Adam and Eve were tempted by Satan just as you and I continue to be tempted by Him today. Remember that God the Father said to God the Son, “Let us make man in our image, after our likeness.” This was His “pet project”. He wanted everything to be perfect, a regular “Garden of Eden”. But Satan was waiting. The father of lies wanted to get back at God and this was his chance. He couldn’t attack God directly so he went after His greatest creation, you and me. And we fell right into his trap. We know all the Old Testament stories; all the examples of how human beings were tempted, how often they failed, and how often they succeeded, with the help of God the Father. God the Son is silent in the Old Testament. The prophets gave hints that He was coming, but it’s only in hind sight that we make sense of the prophecies. The Old Testament is much more about the battle between good and evil, God the father versus the father of lies. The world was a mess. What was God to do? He’d warned us over and over that we were headed down the wrong path and we didn’t listen. How could He get through to us? “God so loved the world that he gave his only Son, so that everyone who believes in him might not perish but might have eternal life.” Jesus must come to earth and live as a man so we’d listen to Him. We may have been made in God’s image and likeness, but we don’t have anything remotely like His intellect. To use a modern phrase, God had to “dumb down” the message so we’d understand it. While Jesus was here He lived like a man. He did everything any other man would do EXCEPT SIN. In spite of being tempted many times, he remained sinless, just like His Father. Since the people of the time were expecting the Messiah to come as a mighty and powerful savior, we know that many of them didn’t accept Jesus as the Son of God. He had to perform signs and miracles, just like His Father to prove that He was who He said He was. He was God’s son and anyone who spent any time with Him came to understand that. The signs were all there for anyone who took the time to see them. Jesus may have been the Son of God but He was also the stepson of Joseph. He may have been a little easier to raise than some other kids, or maybe not. Joseph went through a lot. Not just the visit from the angel, or the unexpected pregnancy of his young bride. Twice the angel came back to him to tell him he must give up his business and take Mary and Jesus to another place. We don’t know when he died. Not one word of his is recorded in the scriptures. Joseph wasn’t an essential part of the story….or was he? Mary was Jesus’ mother and God was His Father. Why did the Blessed Mother have to be married? One obvious reason was that single moms were frowned upon in Jesus’ time. Life would have been much more difficult for Mary and her Son had they lived alone. But while Jesus showed us the way to heaven by becoming a human Son and Mary showed us the virtue of surrendering ourselves completely to God’s will, Joseph showed us how to be a father. I don’t think he gets nearly enough credit for what he did. Joseph must have been just like every dad. Kids don’t come with instruction books, especially a kid like the Son of God. We do the best we can with our limited experience but most of us are pretty clueless. I know I was, and still am, even after four kids. Anything we do right is either a result of observing another dad, usually our own, or by divine providence. As a father I’ve always trusted in God to smooth over my mistakes and my constant prayer is that He’ll watch over my kids and forgive me for my shortcomings as a parent. Did Joseph ever fail as a father? I’m sure he did. After all, he was the only person in his household who was capable of committing sin. Imagine what that must have been like. If somebody ate all the cookies, it had to be Joseph. If somebody left the front door unlocked, it had to be Joseph. It couldn’t have been easy being the only sinner in the house. Today as we celebrate our dads, and granddads, and uncles, and older brothers and anyone else who has filled the role of father in our lives, remember that it’s not an easy job. God the Father, Joseph, and all of us earthly dads have an important role to play, one for which we may or may not be properly prepared. Fortunately we have Joseph, the stepfather of our Lord to use as a role mode. And we have the Father of us all, the creator of the universe, the all powerful God to fall back on. He’ll never let us down and is always there for us. He answers all our prayers. All we have to do is call on His name: whether it be in the name of the Father, or the Son, or the Holy Spirit. Amen.